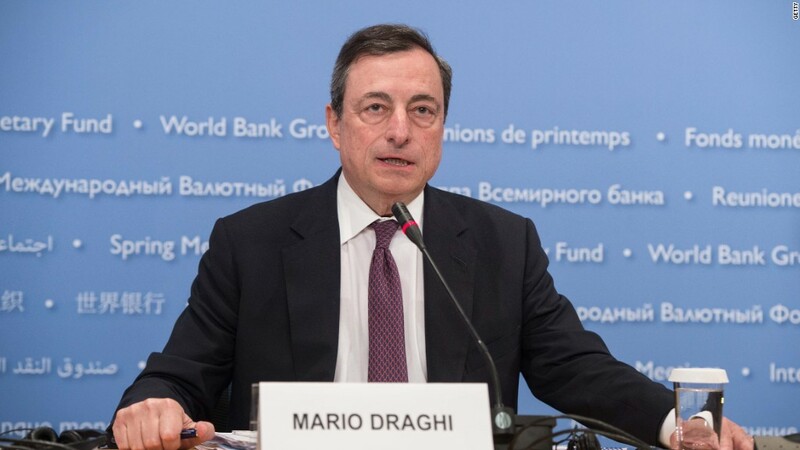 Europe's feeble economy will get another shot in the arm Thursday when Mario Draghi is expected to unveil an interest rate cut and even more money printing. The move has been telegraphed. The only question is just how bold a step the European Central Bank will take to get growth rates and prices moving higher again. Since ECB President Draghi signaled that a new wave of stimulus measures was on its way in October, eurozone growth has slowed again and inflation hasn't moved -- bolstering the case for action. Most investors are expecting the ECB to cut its deposit rate even deeper into negative territory, and to print at least another 500 billion euros ($530 billion). The ECB will use the new money to buy government bonds and other securities. The aim: encourage banks to lend more cash to households and companies, while making it cheaper for businesses to borrow. "We think the [ECB] will increase monthly asset purchases from the current 60 billion euros to about 70 billion, effective January 2016, and extend this pace to at least March 2017," wrote Pimco's Andrew Bosomworth earlier this week. The central bank's current stimulus program -- known as quantitative easing -- was launched in March. Back then, Draghi said the effort would run at least until September 2016, giving it an initial value of 1.1 trillion euros. Some experts believe Draghi may even go further, if he can persuade skeptical colleagues about the benefits of more intervention. UBS says markets are expecting an increase of about 12 billion euros a month in ECB stimulus; Berenberg bank is expecting an increase of at least 15 billion. Others argue the ECB will stop short of buying more bonds and just cut rates. Either way, investors expect some action and have been buying stocks and selling the euro in anticipation. "We would argue that if the ECB fails to deliver, this would be taken badly by equity markets," noted analysts at UBS. More ECB stimulus could leave the two most powerful central banks in the world moving in opposite directions. Many expect the Federal Reserve to raise interest rates for the first time in almost a decade when it meets December 15 and 16. One euro is now worth $1.06, down from $1.15 just two months ago -- that's a fall of nearly 8%. That should help European exporters struggling with weaker demand in emerging markets, but it's hurting some U.S. companies. European stocks have gained about 11% since the start of October.